An underwater search will be conducted in the surrounding area of ocean where two seat cushions thought to be from the plane carrying Emiliano Sala and David Ibbotson were found. four square nautical miles as the parameters for the subsequent search. ​​As reported by ​BBC News, the search, which will use sonar equipment to seek out any wreckage on the sea floor, will not start until the end of the week due to the current inclement weather and sea conditions. A spokesman for AAIB revealed that once the procedure was up and running, it would take "up to three days" to complete. The Argentine forward had just signed for ​Cardiff City in a club record £15m deal, and was flying from Nantes alongside pilot David Ibbotson to join up with his new teammates in the Welsh capital, when his plane was lost in the English channel. The official search that began once news broke of the plane's disappearance was called off last week, but more than £290,000 has subsequently been raised for a private search to continue the efforts. In their first game since the tragedy, the Bluebirds paid their respects to the 28-year-old striker and Ibbotson with a minutes applause at the Emirates Stadium, as flowers were laid in the centre circle. 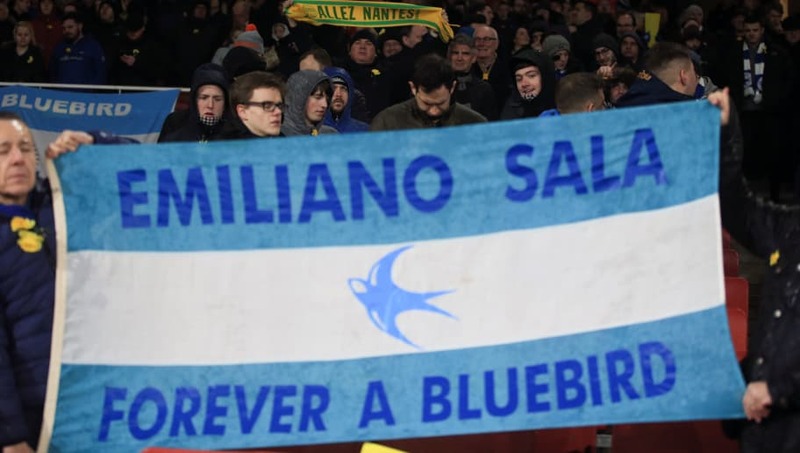 In the away end, fans held aloft a banner which proclaimed: "We never saw you play and never saw you score, but Emiliano our beautiful Bluebird we will love you forever more."